Hatha yoga, according to ancient yogic texts, was originally made up of the Yoga Shatkarmas, or six groups of yoga purification practices. These practices are also called Yoga Kriyas and were used to purify the body of toxins, and to ensure safe and successful progression along the spiritual path. These powerful techniques must be personally instructed by a yoga master as to how and when to perform the yoga shatkarmas according to individual needs. It should be understood by all readers and visitors of this website that you assume full responsibility for trying these techniques without any personalized guidance. Please contact me with questions if necessary. Three of the Yoga Shatkarmas are safe to start practicing on your own: Jala Neti, Kapalabhati, and Tratak. You can find detailed instructions below. Jala Neti refers to cleansing the nasal passages with water and has been used by practitioners of Ayurveda and yoga for thousands of years. A simple yet very powerful technique, Jala Neti works wonders for chronic sinusitis, and allergies. It has a remarkable effect on upper respiratory tract infections dislodging and washing out allergens, dust, and other pollutants. You will be surprised at how easy it is to perform. Ideally, a neti pot should be used. A neti pot can be found at your local Whole Foods Market or a yoga studio. First, make the saline solution: dilute a pinch of non-iodized salt in a glass of filtered body-temperature water. 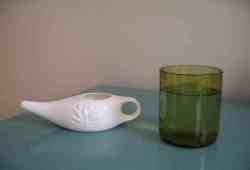 Pour the saline water into the Neti pot. Over a sink, tilt the head forward and to the side so that one side of the nose is higher than the other. Insert the spout of the Neti pot into the upper nostril. Let the water run into the nostril, through the sinuses, and out the other nostril for a few seconds. Switch sides a couple of times. A burning sensation indicates that too much salt was used, or the water is too cold or too hot. In between and after the rounds, blow the nose gently to cleanse any mucus. When finished, dry the nostrils with gentle Kapalabhati breathing, each nostril separately and then both at the same time. This practice involves passing a specially prepared cotton thread through the nose and out the mouth, back and forth a few times. Please do not try this yoga shatkarma without supervision of a trained yogi. as a meditation once a day. Benefits: clears the eyes, improves eyesight, relieves nervous tension, anxiety, depression, and insomnia. How to: Sitting in a meditation position, gaze steadily at the tip of the wick of a lit candle. Try not to blink, or move the eyes in any way. Do not strain. Just keep a soft steady gaze. After 1-2 minutes, when the eyes begin to tire or to water, close them and gaze internally at the after-image until it begins to fade. Repeat the practice once more. Palm the eyes for a couple of minutes afterward.